18.98Hz. Sound at this frequency is below the threshold of human hearing capabilities, putting it into the "infrasound category." There has been much talk about Bigfoot having the capability to create such range of sound which many people refer to as "zapping." But, there has long been held a belief by many researchers that the feelings of being haunted could be created by a frequency in this range. This begs the question - do ghosts create this frequency when present or does this frequency in the environment make us feel like it's haunted? One scientific researcher was in the lab late at night. He went out, came back in and had a sense of being watched. He turned to see an object and then it disappeared. LINK: Science guru Neil deGrasse Tyson explained the phenomenon on his podcast Star Talk Radio Show. Tandy's infrasound resonated at the same frequency as the human eyeball, 18.98 Hz. "When that happens, your eye begins to see things that are not there," Tyson said. "It's interesting when something is supernatural, just think about it a little bit further." An experiment performed at Eastern State Penitentiary showed that when it rained, with the spoke-like fashion of the hallways, infrasound was created and that could make people feel uneasy or even see shadow people. The pineal gland is a small gland in the brain that floats in cerebral spinal fluid and is the size of a grain of rice. It has a pathway to our ocular sector so that when it gets dark outside, melatonin hormone is released to make people sleepy. It also contains a bit of magnetite to help give us our own internal compass. But, what happens if the magnetite is drawn by the magnet and the gland moves in the cerebral spinal fluid and with its linked pathways to occular - might we see things? 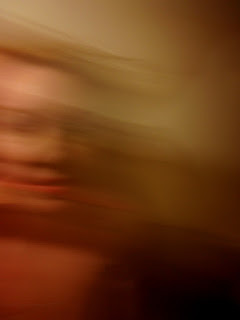 Well, Rawls claimed that as he did the experiment over weeks, he began to see an apparition, then he could see through walls, and at one point the apparition saw him and was frightened, at which time he stopped the experiment. There are many ways involving magnetism and with frequency that we could affect our visual and perceptions. Some believe that DMT hallucinogenic helps people to see the real world, further dimensions, and others believe it simply makes us hallucinate what is not there. LINK: For such a simple and widespread molecule, N, N-Dimethyltryptamine (DMT) has done a remarkably good job at frustrating scientists. Famously dubbed “the spirit molecule” by Dr Rick Strassman, this tryptamine alkaloid produces an intense psychedelic experience when ingested, and appears in trace amounts in human blood and urine, suggesting it must be produced within the body. The purpose it serves, however, remains a mystery. Some scientists think it is released in the body for sleep state/dreaming and for the moment of death. This is actually a feasible reason for us to have it, as the mind having hallucinogenic dreams for a few hours every night would make perfect sense, as well as animals dreaming. When the body parks itself for rest after the pineal gland notes it's dark and time to release melatonin to sleep, something has to activate the imaginings that occur in REM state. This video (above) does an outstanding job of describing the effects on your mind under the influence of DMT. Check the 7:46 point and listen. 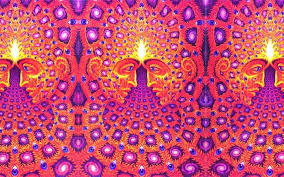 Or did ancient man ingest DMT to create such imagery? In a prehistoric time period where it was critical to find food, shelter and hide from harm, it is hard to imagine the leisurely time to contemplate the spiritual. It could be those very visions that helped man accelerate his creative thinking and to rise to a higher level of intelligence and a spiritual point of view. The question now becomes: Does infrasound or even magnetism and DMT affect us to be able to see what is really there but we have had no receiver to interpret or does it make us imagine? When we look at all three instigators, they are tied to the pineal gland, as a gland that is effective for the possible release of DMT for dream state, having magnetite being vulnerable to magnetic pull, and floating in cerebrospinal fluid, being vulnerable to vibration from infrasound. 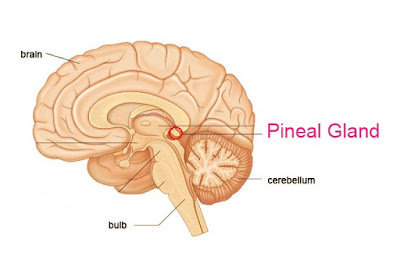 The pineal gland may be small, but it packs a lot of wallop! If this "third eye" as we have come to call it is the true seat of our otherworldly experiences, is that because it makes us fantasize and see things or because it allows us to finally see more of our universe? Our team Arizona Paranormal Research hopes to work on this dilemma a good deal this year and report the findings.